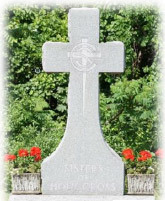 Sisters of Holy Cross - What's New? Two sisters in the U.S. Sector expressed an interest in and responded to the invitation to participate in the International Session which will be held in Le Mans. Eleanor LaBranche and Lucille Gravel have been granted the privilege of attending this session. In addition to visiting the meaningful sites in Le Mans, Eleanor and Lucille intend to make of this a pilgrimage. Their greatest hope completing this pilgrimage is to obtain a miracle in the life of “Baby Brady” by petitioning Father Moreau for a miracle -- a miracle that could possibly raise our Founder to the rank of sainthood. Let us all join in mind and heart with Lucille and Eleanor as they embark on this journey! August 2019: Art Exhibition – "Sister Eva LeDoux on Review"
This summer, the Sisters of Holy Cross are presenting you this occasion by sponsoring an Art Exhibition/Sale on Island Pond Road, Manchester, NH. The Sister Eva LeDoux Art Committee is hoping that you will mark your calendar and join us for this eventful experience on the second weekend of August. (More details will follow in your personal invitation). As many of you already know, Sister Eva LeDoux’s art career was quite extensive. Her numerous landscapes, seascapes, portraits and varied life- giving flowers already embellish a variety of art collectors’ spaces and form part of museum collections. The Sister Eva LeDoux Art Committee would like to make her work available to friends, acquaintances, former students and admirers of this talented woman’s gift. We are hoping that you will come to the ART EXHIBITION — SISTER EVA LEDOUX on REVIEW and select something small or something big that responds to what you are looking for. If you would like to receive a personal invitation with specifics, please send your name and address by email to blanche3069@yahoo.com as soon as possible and you will be first on the list! Congratulations to all of our Jubilarians! Let us give thanks and rejoice as we celebrate and thank God for the gift of all these dedicated women. March 23, 2019: Mission Day – For the Sisters of Holy Cross ONLY - "Enter into the Adventure of Growing Old Gracefully"
You are cordially invited to participate in our MISSION DAY – March 23, 2019 (Snow Date March 30, 2019). If you do not belong to a Mission Group, no problem. It will be your prerogative to join any Mission Group for this half-day session. Mission Groups: Justice & Environment, Pastoral, Women’s Group, Children & Young Adults. Our focus for this day will be to recognize how we “live our precious elderhood with as much purpose and passion as possible”. Please respond no later than Wednesday, March 13th, to Diane Y. Dupere, CSC either by phone 622-9504 or via email dydupere@srsofholycross.com. If you are signing up for a Mission Group, please let me know which group you will join. Elaine Poitras will be attending the statutory meeting of the mission groups for Children and for Youth and Young Adults which will be held in Cape Haitian, Haiti from February 22-24. The delegates from these groups have been asked to arrive on the 18th and plan departure for the 26th. Because flights into Cape Haitian are few and fairly far between, she will be leaving Manchester on the 18th and will stay overnight in Fort Lauderdale to arrive in Haiti on the morning of the 19th. She will return to Manchester on the morning of the 27th. The question that they have been asked to address is: How can the theme Embrace Difference be effectively incorporated into the lives of the youth and children in our centers of mission? Please pray for safe travel and for all the delegates as we continue to discover ways to develop this reflex in our children, youth and young people. Subsequent to the very positive reactions heard here at St. George Manor on Island Pond Road in Manchester to the message and statistics regarding our youngest members which Raymonde sent in her Communiqué No. 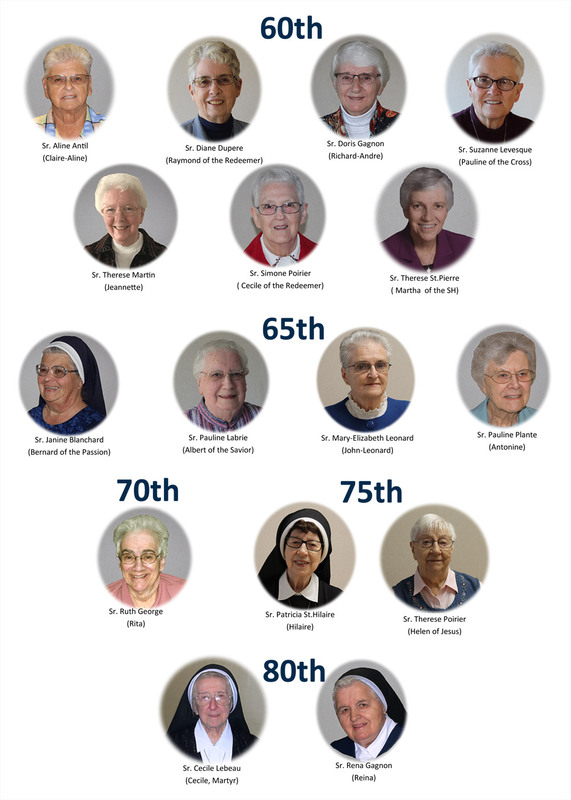 9, the members of our community of elders, on the Day of Consecrated Life this last February 2, wrote a message to the sixty-one young sisters in initial formation. What each one in the community here shared on paper was compiled--with nothing added or deleted--and became an open letter that we have sent to these young. With joy and gratitude to God the Sisters of Holy Cross and the Mamani Sucasayre Family are pleased to invite you to the profession of perpetual vows of Marisol Fany. We are happy to inform that the 2018 Jacqueline R. Verville Community Service Award was presented to Pauline Maurier, CSC from the Holy Cross Family Learning Center at the recent Spaghetti Supper Fundraiser held on May 17th. Sister Jacqueline herself read a beautiful commencement that portrayed Sister Pauline’s community service very truthfully. 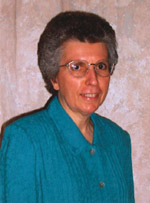 The Sisters of Holy Cross are proud to nominate Sister Pauline Plante, CSC, as a recipient of the 2018 Micah Award. 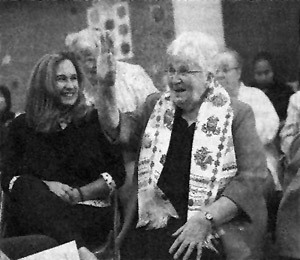 Sister Pauline’s exemplary life of doing justice, loving mercy and walking humbly with God in service to her sisters and brothers did not begin only in 1993 with the founding of the Berakan Renewal Program. From the time she entered into the Sisters of Holy Cross, in her various ministries as a teacher, principal, PRH (Personality and Human Relations) educator and co-founder and counselor of Home for Growth in Londonderry NH. (a residential program that promoted healing and personal growth). In all her ministries she was always drawn to the poorest, neediest and most wounded among those she served. There is a verse in the constitutions of the Sisters of Holy Cross that urges them to “love with the very tenderness of the heart of God”. This verse describes and summarizes the Sister Pauline Plante they’ve lived and ministered for so many years. They have never known anyone more deserving of the Micah Award. On Monday, May 28, 2018 we will gather in “Quiet Remembrance” for all of our Sisters called home in previous years. Click the button below for a complete list. We are both happy and proud that Sr. Jackie will be receiving this award later this month. She has spent six decades of her life in education. She founded the Holy Cross Family Learning Center. The center teaches immigrants the English language, civics and culture of their new home. 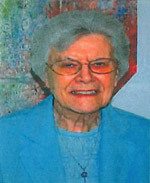 She spent her earlier years teaching at Catholic schools and earned teaching degrees in New Hampshire, Massachusetts and Connecticut. Through Sr. Jackie’s efforts she has given immigrant and refugee families hope for success, helpes them find jobs and helped them with their finances. After retiring last October, she became active in rallies outside the Norris Cotton federal building in Manchester protesting deportation of illegal immigrants. She met with officials from US Immigration and Customs Enforcement to provide concerns. She still talks proudly of the Holy Cross Learning Center and she remains on the board. She said she would teach a class or two if she’s asked. The Granite State Legacy Award is given to New Hampshire residents that have made significant contributions over an extended period of time to their profession, community and state. This year’s awards will be presented Thursday, May 31st at the New Hampshire Institute of Politics at Saint Anselm College. The ceremony begins at 5:30pm. Tickets are $45 and include hors d’oeuvres and cocktails. To register visit unionleader.com/legacy, email psirianne@unionleader.com or call 603-206-7822.